Well today’s St George’s Day and it’s been the first nice day of the year. The ground is now not cold to the touch so it’s time for planting! If you read my earlier post, you’ll know I am trying out a new way of vegetable gardening called the Lasagna Garden method. The long and short of it is you put down layers of compost interspersed with carbon layers like cardboard or leafmould. This way you get a nutrient rich growing medium with plenty of worms and other wriggly things. It’s a bit of an experiment for me as I’m fed up with all the weeds my normal soil produces. Anyway, today I planted out my seeds. As I’m not sure this type of gardening lends itself to root vegetables, I’ve concentrated on leaf veg this season. The veg I am have planted thus far are chard, leeks, bulb fennel, curly kale, cavolo nero and cabbage. 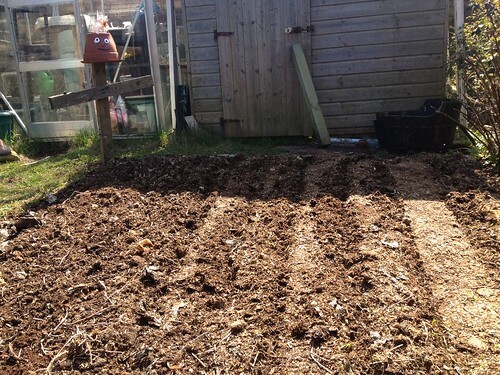 I used the plank method of Monty Don fame to space the rows so every row is about 6 inches (or one plank’s width) apart. 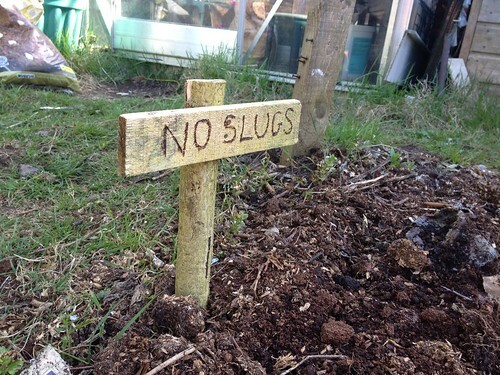 Apart from the weeds and cold wet days last year, it was also the year of the slug and anything that did survive got devoured by the unstoppable army of eating machines. This year I’ve taken measures to protect my garden and I’m confident it’ll do the trick.